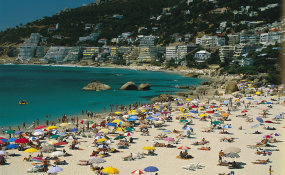 The City of Cape Town will lay a formal complaint against private security company PPA with the Private Security Industry Regulatory Body (Psira) on Monday following reports that the company illegally removed people from Clifton Fourth beach on December 23. Protesters descended on the beach on Friday, slaughtering a sheep in what they termed a "cleansing ceremony" to rid the beach of racism. The City will also reportedly lay a complaint against people involved in the slaughter of the sheep for animal cruelty, and against senior police officers who allegedly prevented City law enforcement officials from stopping it. In an email to the Clifton Bungalow Owners Association on Saturday, the City's mayoral committee member for safety and security, JP Smith called the slaughtering an act of "cruelty" and a "vulgar political gimmick". There are also allegations that the police refused to let the City's law enforcement officials "enforce bylaws" by disallowing the slaughtering, as the City had not granted permission for it to take place, for fear that doing so would provoke the crowd. Smith said that law enforcement officials told him that the sheep was carried across the rocks to the beach, and so they had not seen it until it was too late. The animal was apparently injured before it was carried onto the beach. Smith told eNCA in an interview that the City had received over 140 complaints related to the incident. He told News24 that he did not know when the other charges would be laid. In a statement on Thursday, the City's executive director for safety and security, Richard Bosman, said the City has no contract with PPA and that the company was not operating on its instructions. "Private security companies have no mandate to enforce municipal by-laws. The City has acted swiftly to address the conduct of PPA staff once we became aware of it. Any person who feels that they have been threatened or intimated by PPA staff on the day in question, or at any other time, can lay a charge with the South African Police Service. Alternatively, complaints about the conduct of the company can be directed to the Private Security Industry Regulatory Authority," Bosman said. The South Africa First Forum laid fraud charges against the PPA on Friday night. Meanwhile, the EFF organised a "picnic against racism" at Clifton Fourth Beach on Sunday. The Western Cape ANC held its own picnic on Saturday, the SABC reported.